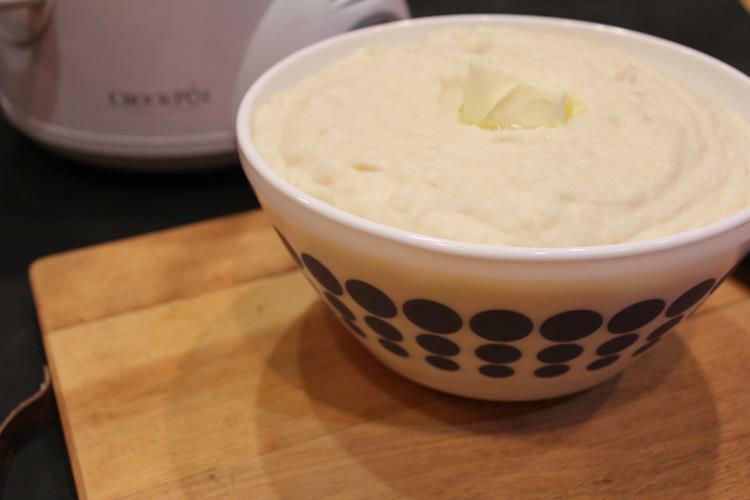 Mashed potatoes made easy by making them in the slow cooker! These crock pot mashed potatoes are perfect for an easy side dish or added to your holiday meal! These crock pot mashed potatoes are so rich and creamy. 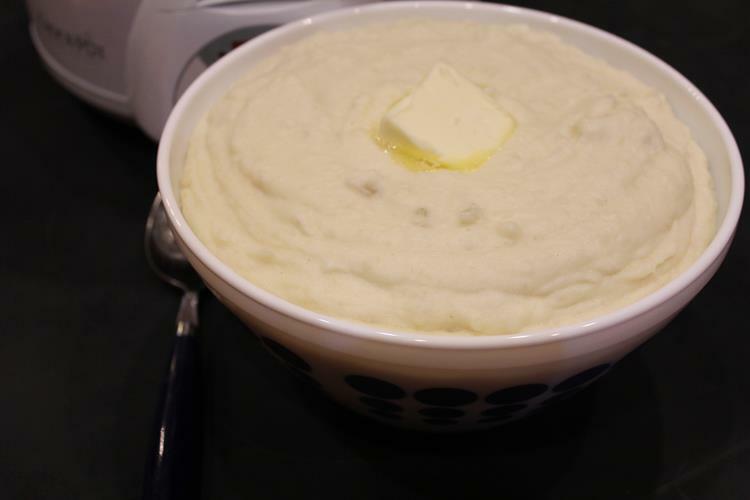 I love the fact that cooking these mashed potatoes in the crock pot frees up my time. I can put these in the crock pot and walk away for a few hours. Then all I have to do at dinner time is mash them and add the sour cream and cream cheese. And yes you can make regular mashed potatoes, but the sour cream and cream cheese make these so much better. No gravy is requited with these potatoes. Yes, you can serve them with gravy, but the sour cream and cream cheese make them a delicious side dish all by themselves. We love these potatoes and the picture does not do them justice. Potatoes are one of those foods that are hard to photograph. Crock Pot Mashed Potatoes are perfect for serving with meatloaf, roast, or a turkey dinner. 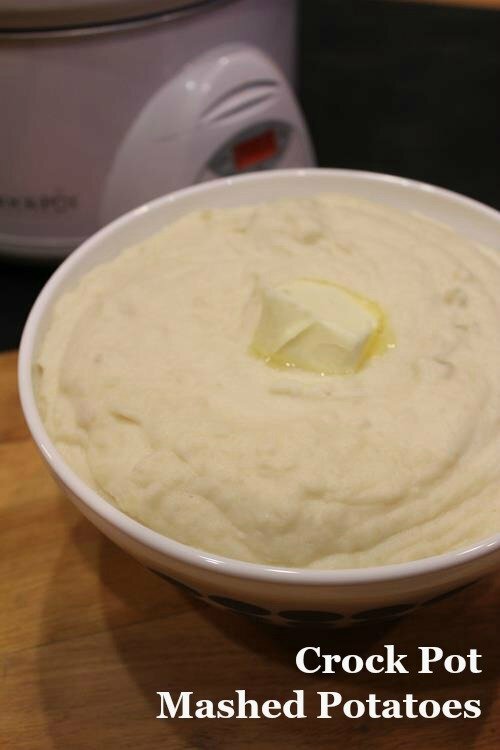 If you have never made mashed potatoes in the crock pot give it a try. You may not go back to the regular way of cooking them. If you need an easy way to make mashed potatoes for a simple side dish or a holiday meal these are perfect! Really they are so good! 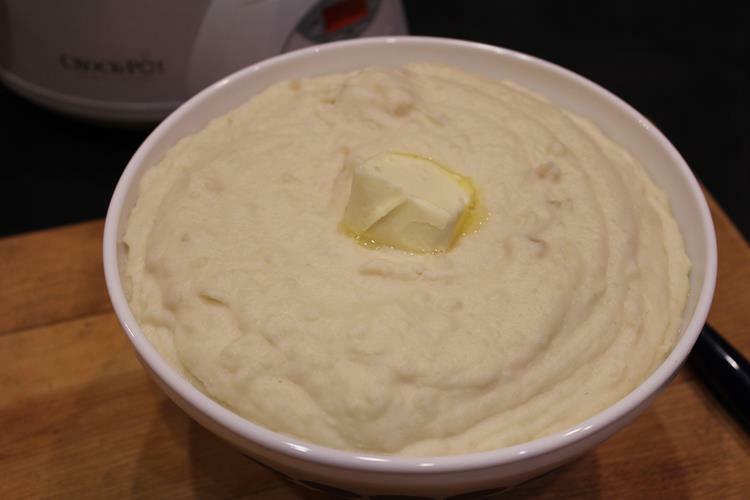 Crock Pot Mashed Potatoes make cooking mashed potatoes easy! Peel potatoes and cut into 1/2 inch chunks. Place potatoes in a crock pot with chicken broth and milk. Cook on low for 4-6 hours or until potatoes are tender. When potatoes are tender mash well with sour cream and cream cheese. Thanks SO much for posting this! We will be in the motorhome at the beach for Thanksgiving this year. This recipe is exactly what I need to be able free up some stove top space. I was JUST looking for a crock pot mashed potato recipe on Sunday! I wasn’t sure how to go about it, so thank you for this great post! A trick I learned is that I can safely substitute 1/3 cauliflower for potatoes in the mash and it goes unnoticed (just be sure the cauli is drained well if you’ve steamed it so it doesn’t make the potatoes watery). I did this for a group of non-veggie eaters and they didn’t notice. I also use onion & chives low-fat cream cheese instead of regular. Tasty and also helps to mask the cauli. Tho’ my fave is when I have leftover french onion dip (homemade with Lipton Onion Soup mix and a container of sour cream). We liked it so much last time in the taters I just may do that each time and just have to find something to do with the remaining dip. Could you do with this with Sweet Potatoes? @Anne, I think it would be worth trying with sweet potatoes. @Anne, Great idea! I have some to cook up for baby food. I was going to toss them in whole like I do butternut squash. I’ll try cubing and report back on Friday! I made these for dinner last night and we had to eat them 2 1/2 hours after dinner and they still weren’t done. I cooked them for 6 1/2 hours. i used russet potatoes and cut them in 1/2 ” cubes. My crock pot is about 2 years old so it should cook pretty hot – it usually cooks things fast. any idea of what the problem might be? @Earleen, I am sorry I do not know why yours took so long. I do know that crockpots vary. I have done potatoes in several different crockpots and they don’t usually take longer than 4 hours. But, next time I would just cut them smaller or adjust the time. It should work fine in your crockpot with some tweaking. No offense, but the picture inspires me never to make these potatoes. Lumps in mashed potatoes are nasty. Not to mention the fact that adding sour cream and cream cheese, interferes with the natural flavor of mashed potatoes. Sour cream and cream cheese are certainly no more healthy than a little butter and heavy cream. I’m sure the reason Earleen had issues with these potatoes being done was the fact that in order to make good mashed potatoes, it is necessary to cook them for a long time on the stove. I can’t imagine how long it would take if you were slow cooking them! @JFS, I have never made mashed potatoes in a crock pot, but I have made them with sour cream and cream cheese, as listed in her recipe above, and I did not have a drop of them left at Christmas. I do not care for either cream cheese or sour cream, so I also made some traditional ones with butter and cream. But my husband and friends really, really enjoyed them this way. And I know many people, including my father and grandmother, who actually prefer ‘smashed’ potatoes, which will have some noticeable lumps, as opposed to what is actually ‘whipped’ potatoes, made with a hand mixer. Wow! I’ve seen nasty replies when someone has tried a recipe and it didn’t turn out… even when they have altered the original recipe and it didn’t turn out. I’ve never seen a nasty reply based on a picture, when they’ve never tried the recipe! I thought the potatoes were delicious and my daughter who doesn’t like mashed potatoes scraped her plate clean. @mrsblocko, I am so glad that you enjoyed them. Thanks for letting me know. @Tamera D’Ostroph, I am so glad that you enjoy these. Pepper gravy would be good on these. That is a great idea. Google brought me to this recipe, then I spent a couple of hours browsing your other recipes last night and I’m back for more! I’m about to get these going so we can have some for dinner tonight, and then freeze the rest. Perfect side dish for some grilled chicken after our baby is born and we need to eat and I don’t feel like cooking! @Mandi, I am so glad that you found my site and are enjoying looking around at the recipes. I hope you enjoy the potatoes. This is fantastic! I loved the flavors and of course how easy it was to make. I was able to put my crock on warm for 6 hrs and the potatoes were perfect. Thanks for the recipe! My crock tends to cook on the slow side. I wonder if this would work as an overnight recipe to serve at our church’s weekly potluck lunch? I think if your crock pot cooks slow/low you could easily just cut the potatoes up a little larger, so they take longer to cook and you would be fine cooking them overnight. I wish I could give this recipe to my brother in law for Thanksgiving. He thinks he makes the best potatoes and acctually no one likes them. Maybe I should just bring this and pretend I thought I was supposed to bring the mashed potatoes? LOL I will try this soon! You make such yummy things! do you ddrain the milk and broth out before mashing the potatoes, or just incorporate that as some of your liquid? I mash them with the liquid. How large of a crock pot did you use for these? I have a 5 qt crock pot, no stove, and am cooking for 5-8 this Thanksgiving. I usually use a 5 to 6 qt crock pot so I think you will be fine. And I think this will easily serve 5-8 for a Thanksgiving meal. I usually figure about 1 potato per person so if you use 7-8 potatoes you should be fine. I hope you have a nice Thanksgiving! Just making this right now! Do you add any salt? It actually tastes almost like it could do without, but I thought it needed about 1/2 tsp. This makes it very easy to make the mashed potatoes while also doing 100 other things…like on Thanksgiving! I can’t believe I missed this in the past. What a great idea. I rarely use anything but my crockpot and my InstantPot, anymore. Occasionally I use an induction burner, but I have not used my stovetop since I cleaned it last summer. It is a ceramic cooktop and a pain to clean, so I stopped using it. I just used the slowcooking feature on my InstantPot, and loved it. Super simple and the same great results as my crockpot. I have two InstantPots and am considering buying the eight quart one. It has really made my life easier.